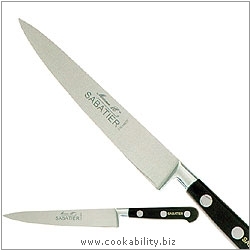 Imported from the original Sabatier company in France. These fully forged, taper ground, knives have a full flat tang and superb balance. High grade polymer handles with unique floating rivets to ensure extra long handle life. Traditional carbon steel takes a razor sharp edge compared to stainless steel and easier to resharpen. These knives are for professional use and require love and care to maintain as they can rust and discolour if neglected. Silver polish can quickly revive though. Not to be placed within 10ft of a dishwasher! Used by professionals who appreciate their lasting edge and ease of sharpening and who don't mind the discoloration that occurs when cutting acidic foods. Wash and dry these knives immediately after use to prevent discoloration.